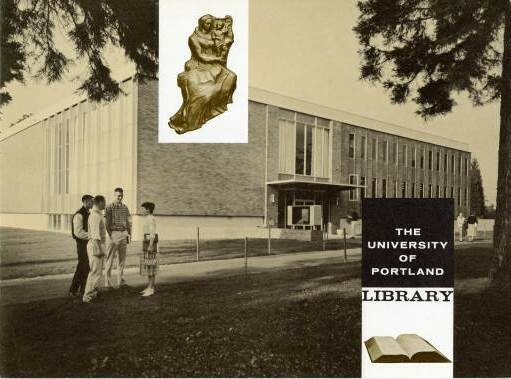 The University Library was in the basement of Christie Hall from the 1930s until 1958. 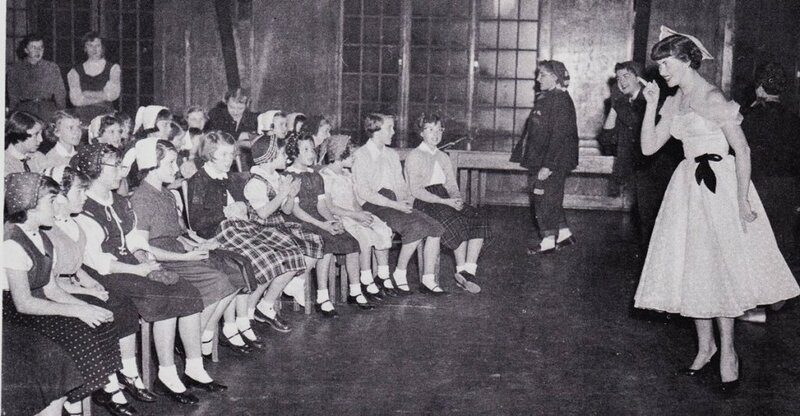 The basement space was quickly outgrown and the book collection put at risk from leaky water pipes — with as many as fifty-one leaks in one year! 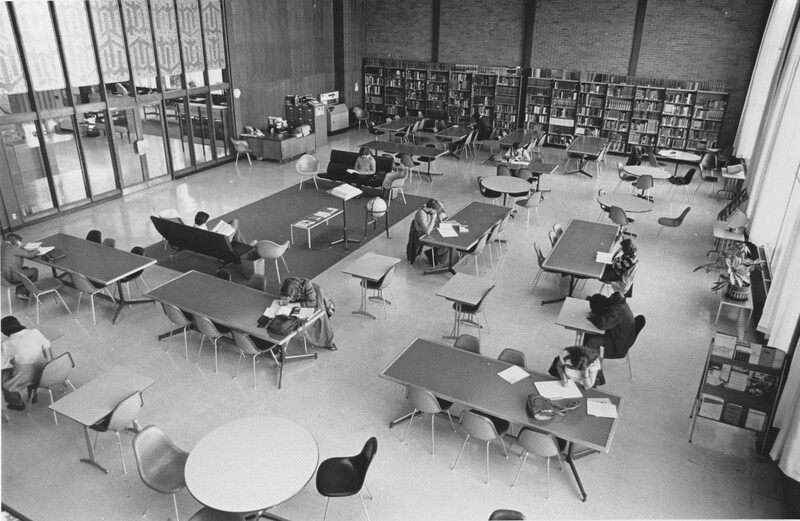 — but there were no resources to move or replace the library and study space. 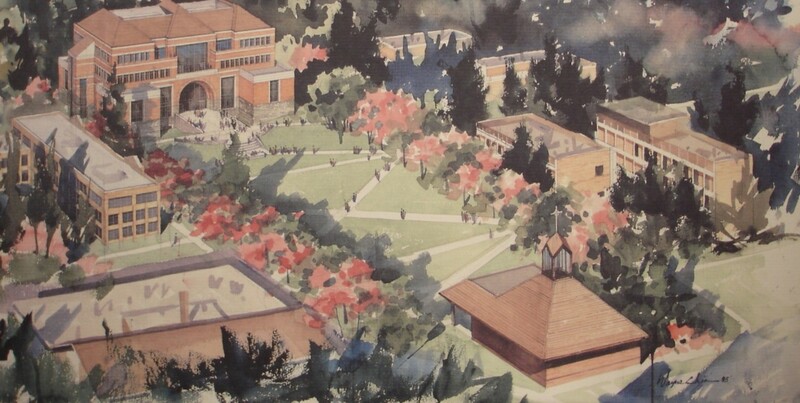 Planning for a new library extended through two decades while gathering funding through private gifts and foundation grants. 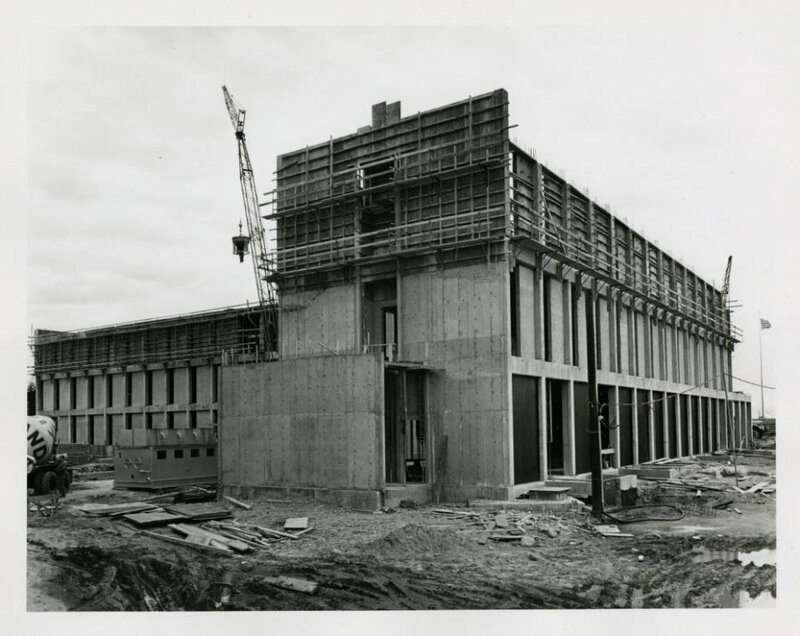 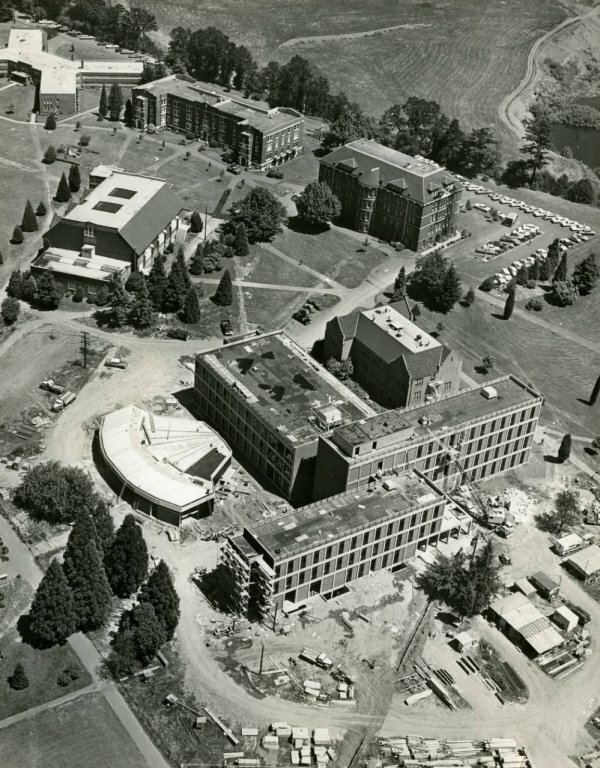 Groundbreaking for the new library occurred on October 24, 1957 and the dedication of the completed building on November 30, 1958. 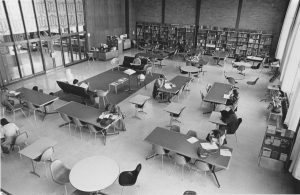 Pictured here is the spacious central study area, from 1958 library and in today’s Clark Library, remodeled and expanded in 1979, renovated in 2013. 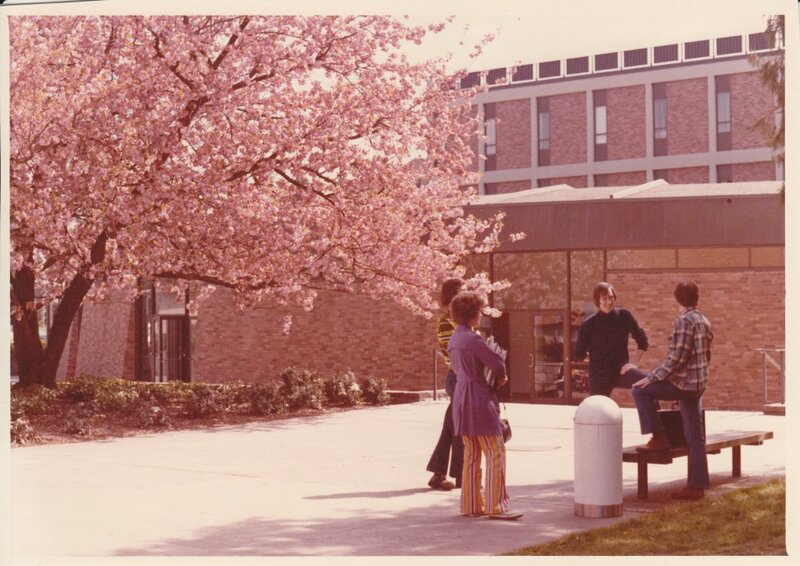 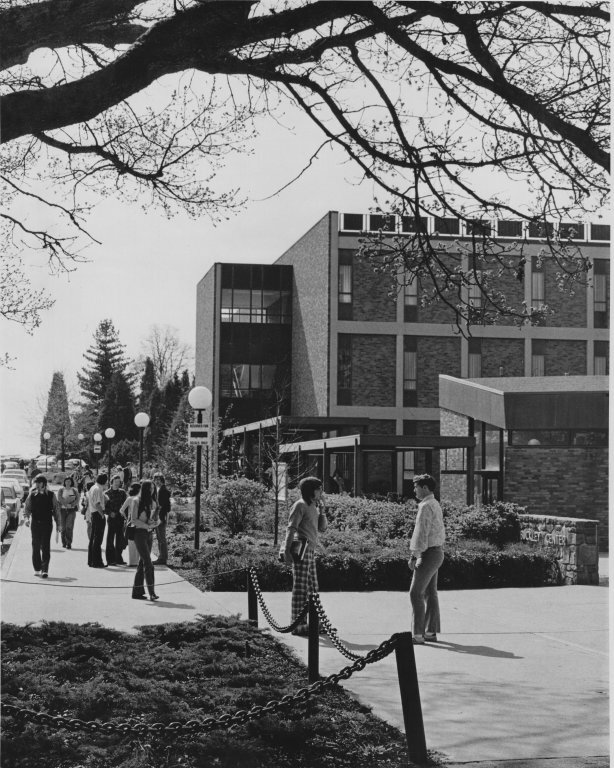 For more pictures and history of the library, visit the Clark Library’s Digital Buildings Collection displaying images of photographs and objects of the library held by the University Archives and Museum (with descriptions from the Archives and Museum). 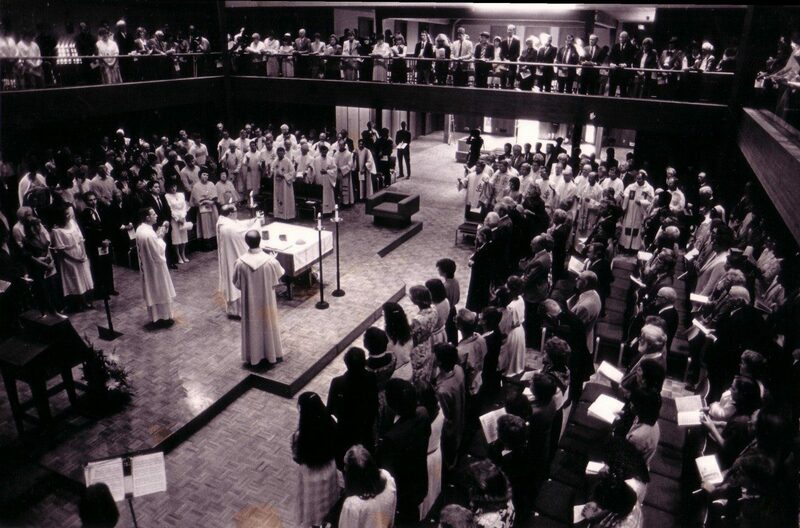 The Chapel of Christ the Teacher was dedicated 5 October 1986, and so is thirty years old this year. 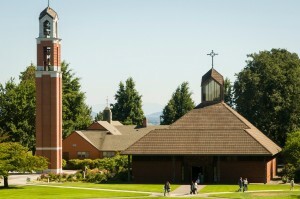 The name of the chapel expresses an essential theme of the University of Portland mission. 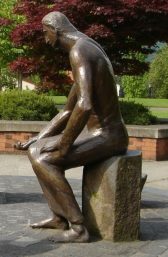 As such, ‘Christ the Teacher’ is a motif that appears and reappears across campus defining and anchoring the spaces of campus life, dating back, probably, since before universities and corporations had a need to write out their mission statements. 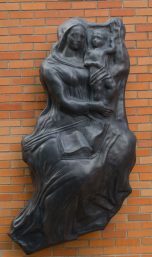 The Sedes Sapientiae bas relief on the façade of the Library (1958) is an image of the child Jesus supported on his mother’s lap. 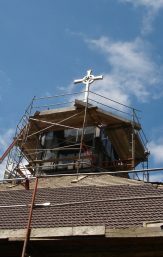 The icon is a flat, literal reading with little poetry or ambiguity: Mary is the Seat of Wisdom because her child, Jesus, teaches from that throne. 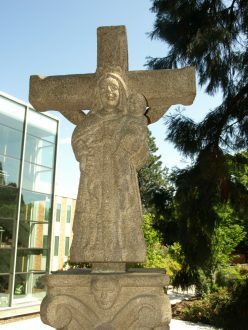 The same arrangement of mother and child is repeated on the reverse face of the O Cruceiro (1986), the granite path-marker which stands sentinel opposite the south steps of the Clark Library entrance. 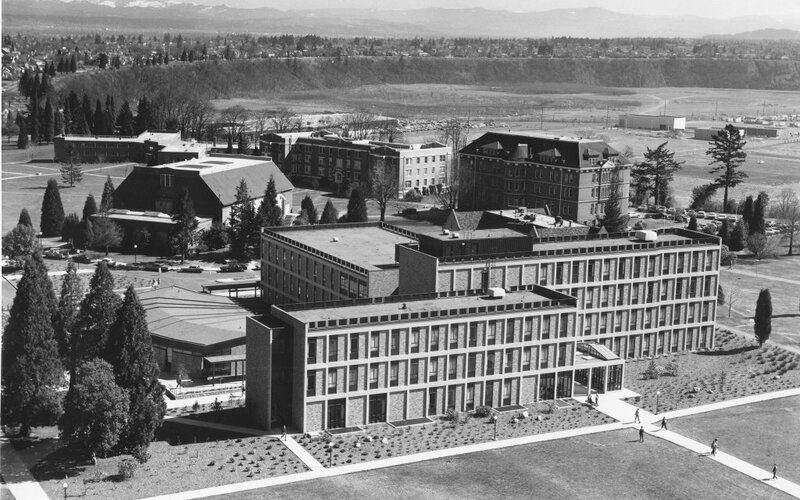 Campus architecture repeats this visual theme in spatial arrangement. 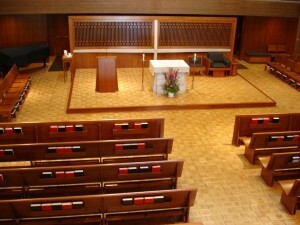 St. Mary’s was constructed (1937) as the first Commons, the student cafeteria. 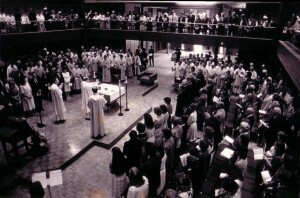 When the current dining facilities were built (1958), the St. Mary’s building was repurposed as the university chapel (1958-1985). 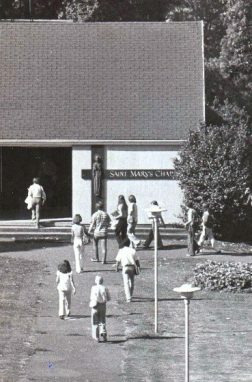 Outgrowing St. Mary’s, The Chapel of Christ the Teacher was our first building designed and dedicated as a chapel. 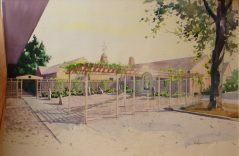 With the intention of maintaining the near linkage between the two buildings, a Marian Garden was planned to enclose the area joining the Chapel and St. Mary’s. 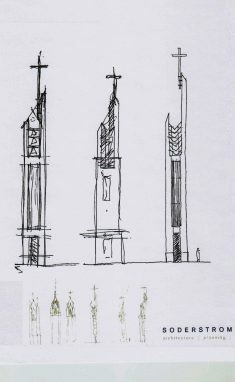 This space for reflection was fulfilled in stages, with the Galati rosary garden (1996) and the Bell Tower Plaza (2009). 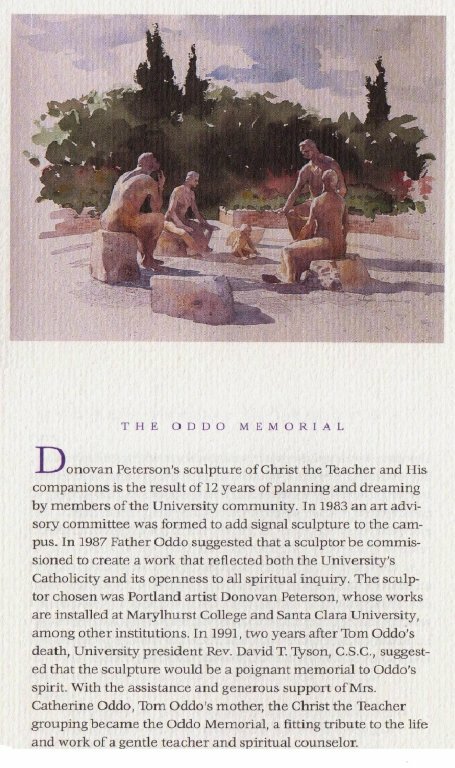 The Figure of Christ the Teacher is also the principle sculpture in the Oddo Memorial group on the plaza between Franz and Mago Hunt Halls, classroom buildings for the Fine Arts, Business School, and humanities classes. 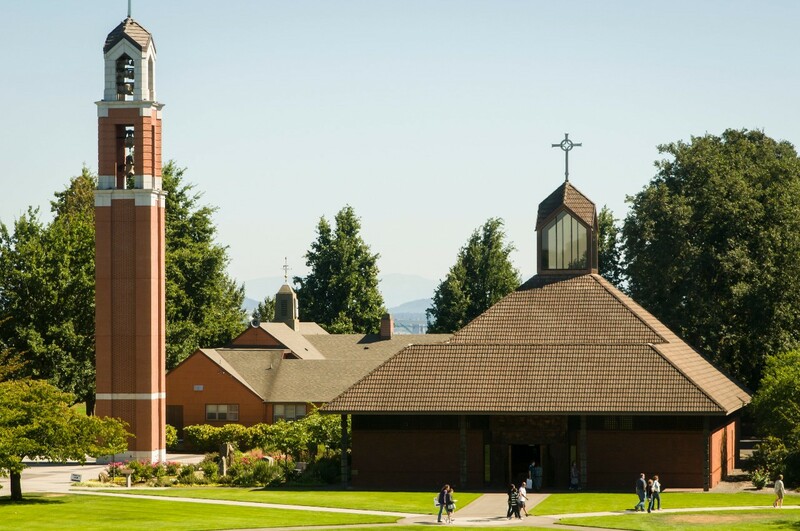 Library, Chapel, classrooms: in prayer, academics, and study: Christ the Teacher is present at the University of Portland. 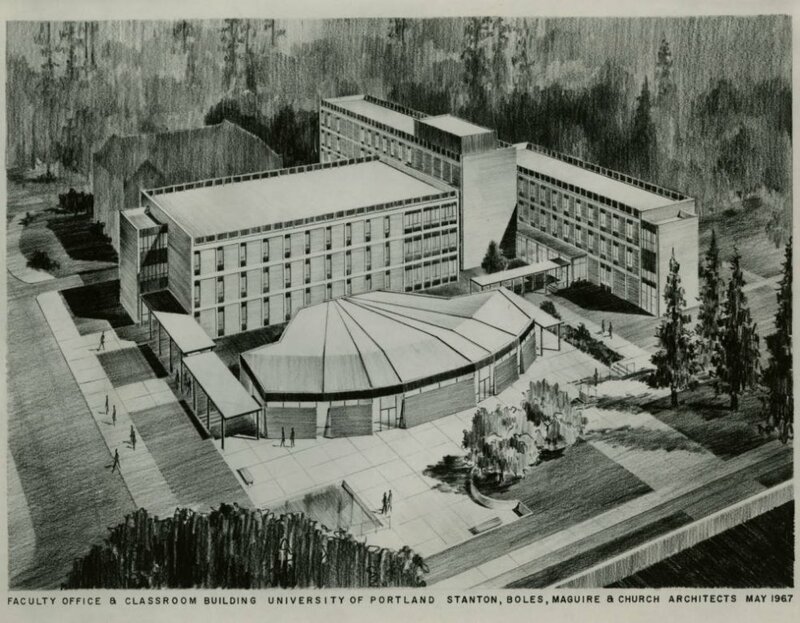 A University campus is a space set apart, consecrated — classroom and quadrangle — space for mind and spirit to soar. 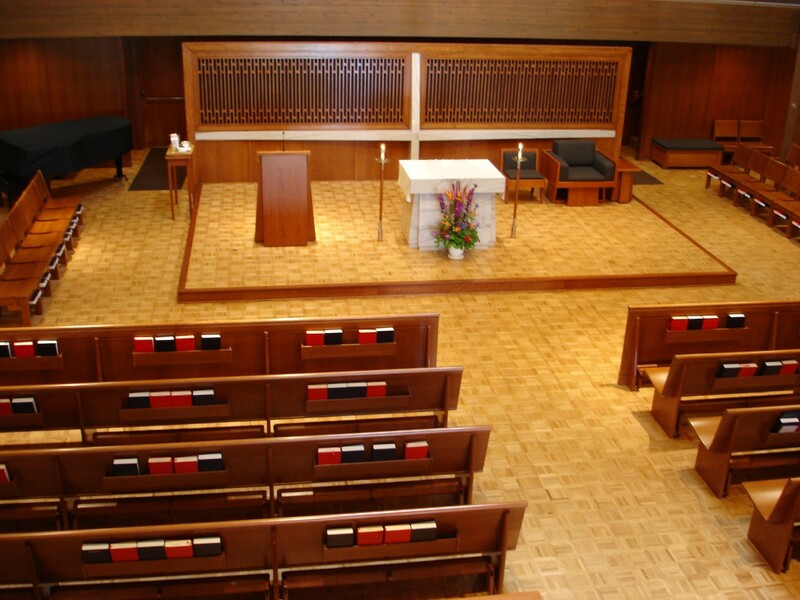 At UP, each residence hall has additional space set apart for a student chapel as an anchor or sanctuary for private prayer and reflection and hall Mass liturgies. 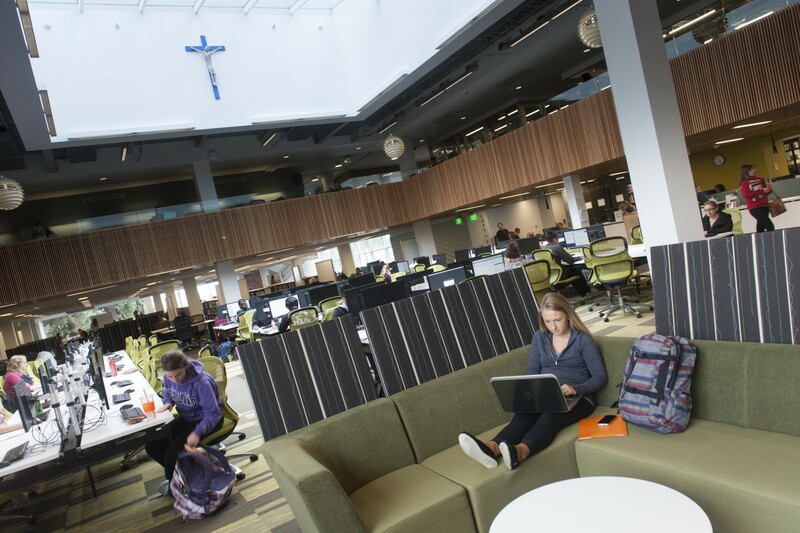 The Chapel of Christ the Teacher squares the Academic Quadrangle, flanked between the Commons for food, Buckley Center for classes. 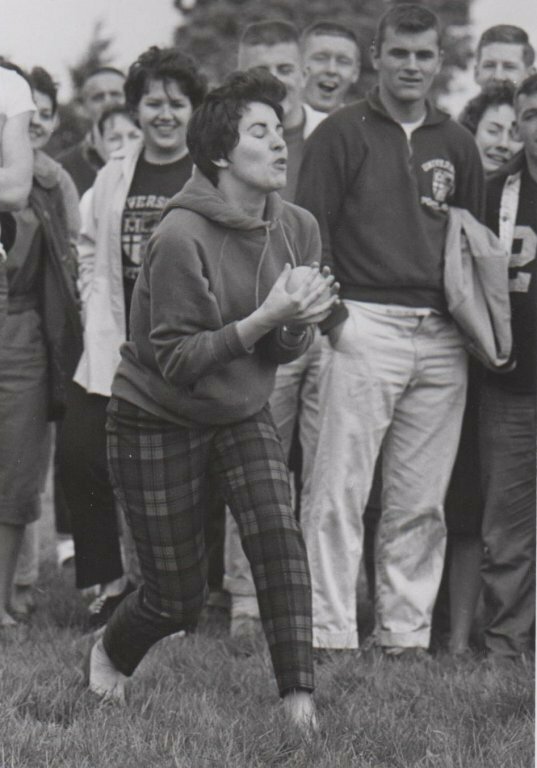 Feeding body, spirit, mind on the Bluff. 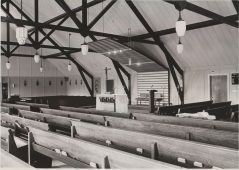 Designed by Oregon architect Pietro Belluschi, with wood carvings by Oregon artists LeRoy Setziol (doors, posts, lintels), the Chapel is a cool building with Oregon textures, a place of quiet and reflection within. 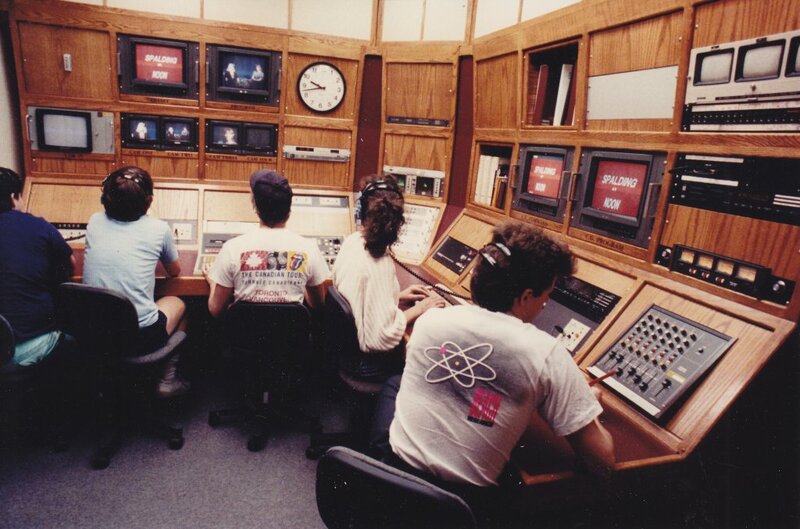 Before there was a dream of a River Campus, KBVM has been broadcasting from the Gulch since 1989. 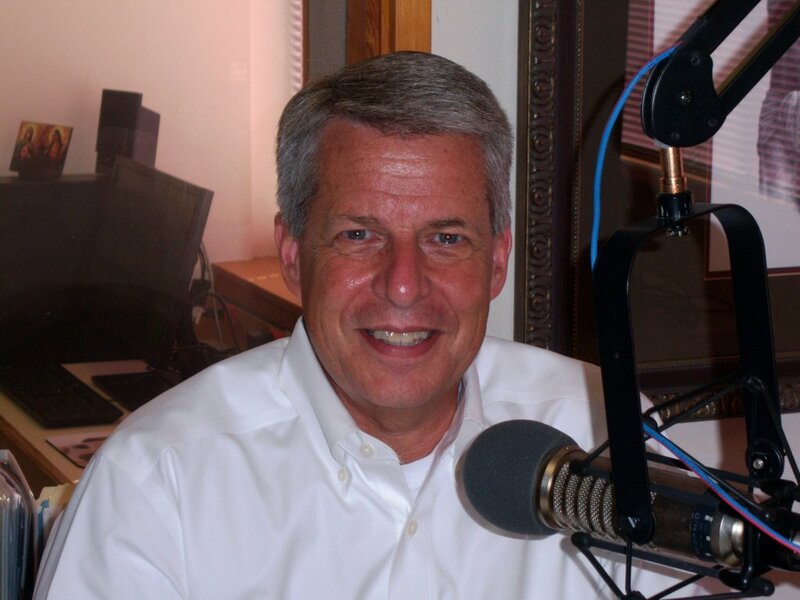 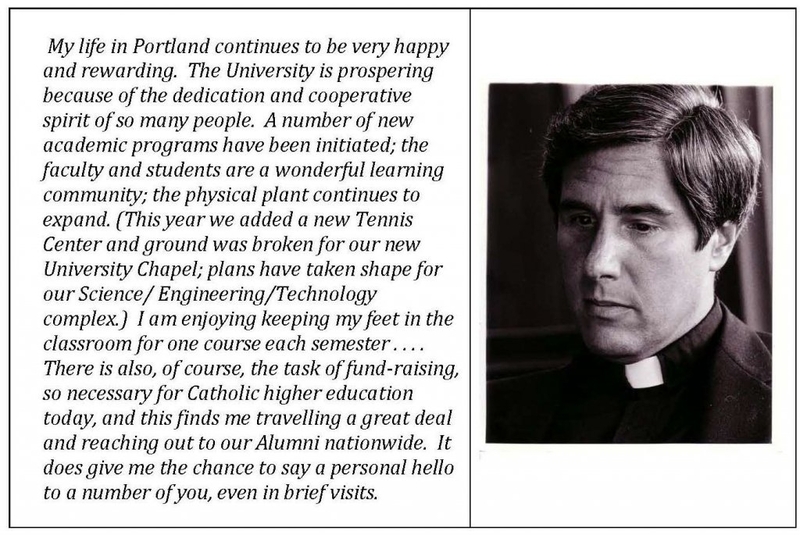 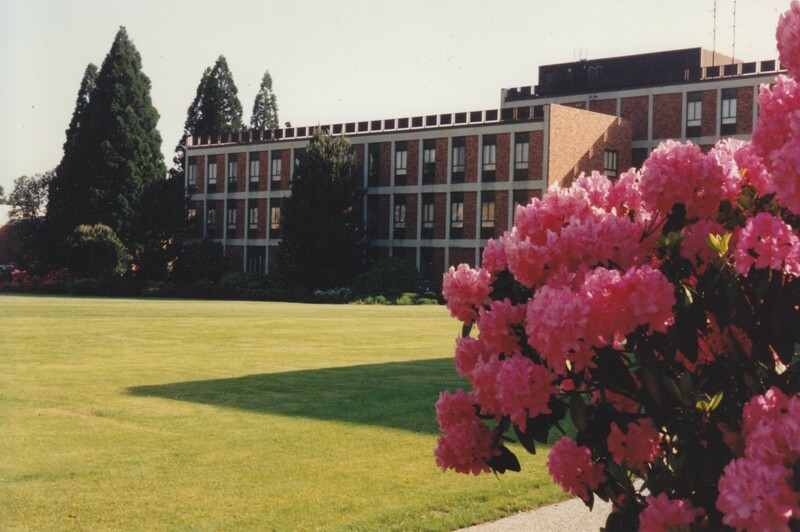 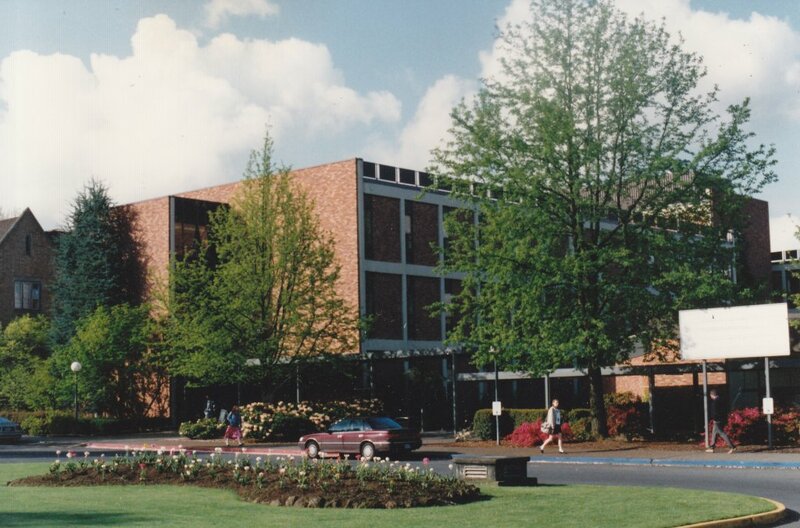 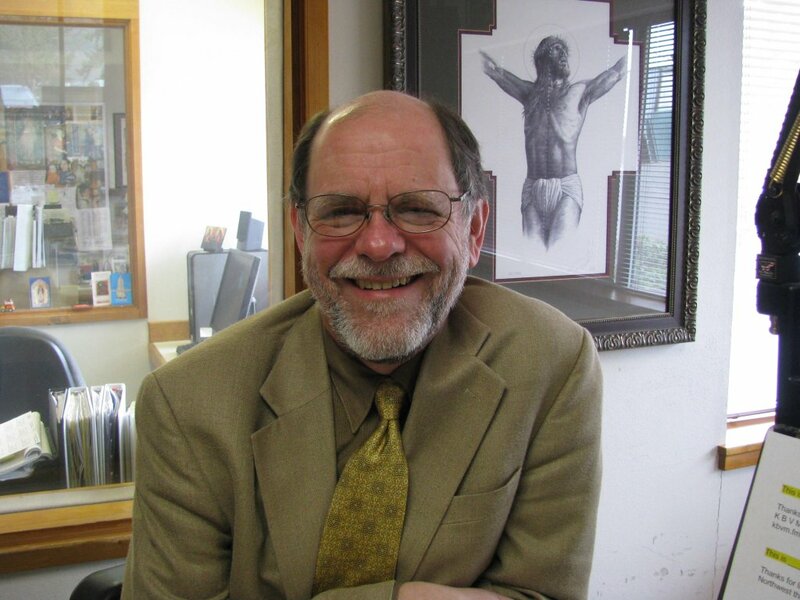 A syndicate of Metro Catholic Broadcasting (MCB), Catholic broadcasting came to the Northwest in 1983, and the University of Portland in 1988 (the UP location was the suggestion of Auxiliary Bishop Paul Waldschmidt, C.S.C., our former president). And so KBVM, named in honor of the Blessed Virgin Mary, a Catholic radio station stands today in the gulch between Physical Plant and Mehling Hall. Ground broke for the KBVM radio station on February 28, 1988 and the building was completed the summer of 1988. 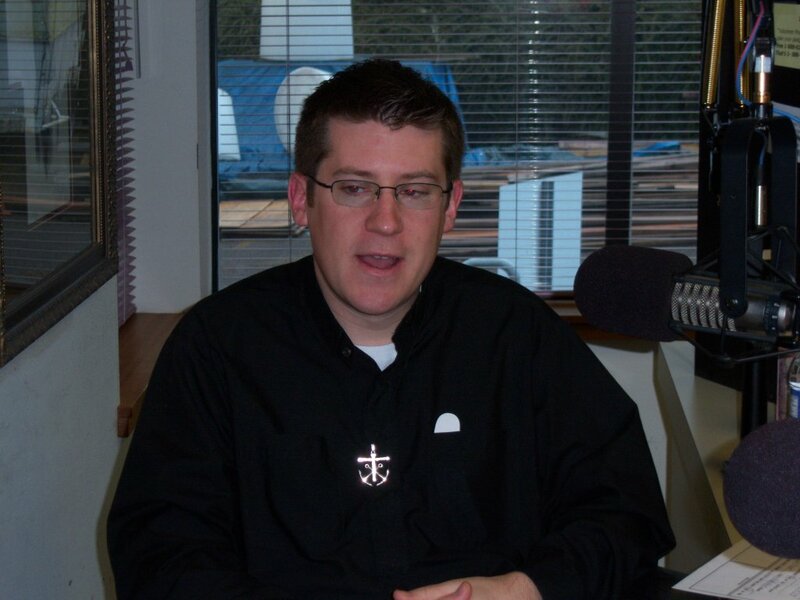 KBVM was dedicated and formally went live on the air in the Portland metro area on the feast of the Immaculate Conception, December 8, 1989. 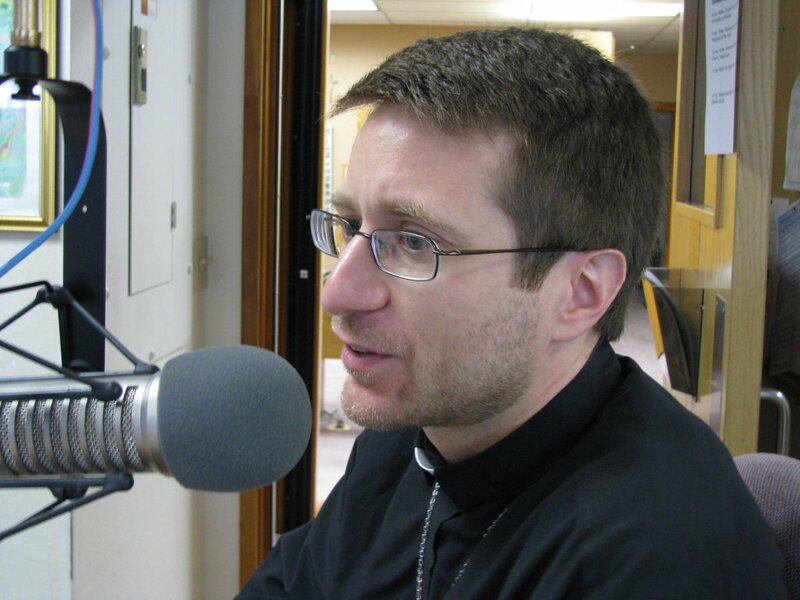 Today, celebrating the 25th Anniversary of the Dedication, KBVM (88.3 FM) provides live recorded programming that includes Christian liturgical and sacred music; live interviews with Catholic clergy, including diocesan and Holy Cross priests, local and national speakers and musicians, religious groups, and organizations; prayers and devotions; Catholic news, and even Catholic sports updates. 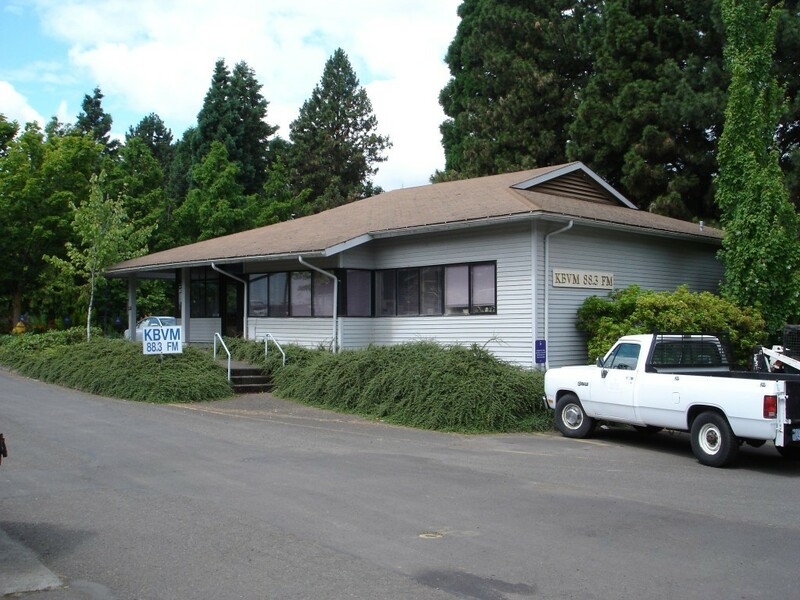 KBVM’s signal can be heard from Vancouver to Salem and its sister station, KMME (94.9 FM, 100.5 FM), reaches listeners in Eugene, Springfield, and Cottage Grove. 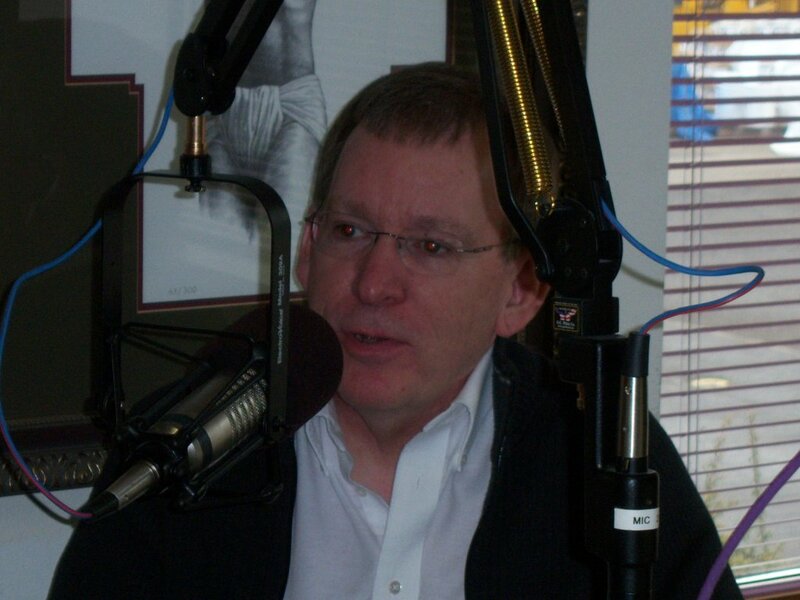 Online audiences can follow KBVM anywhere at www.kbvm.fm. The Praying Hands monument on the quad near Kenna and Christie halls has been a place of care and observance since 1948. 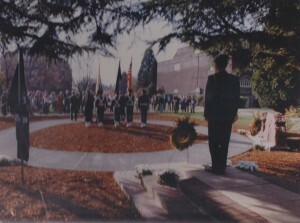 A graduation gift to the school from the Class of 1948, the bricks carry the names of the dead from World War II. 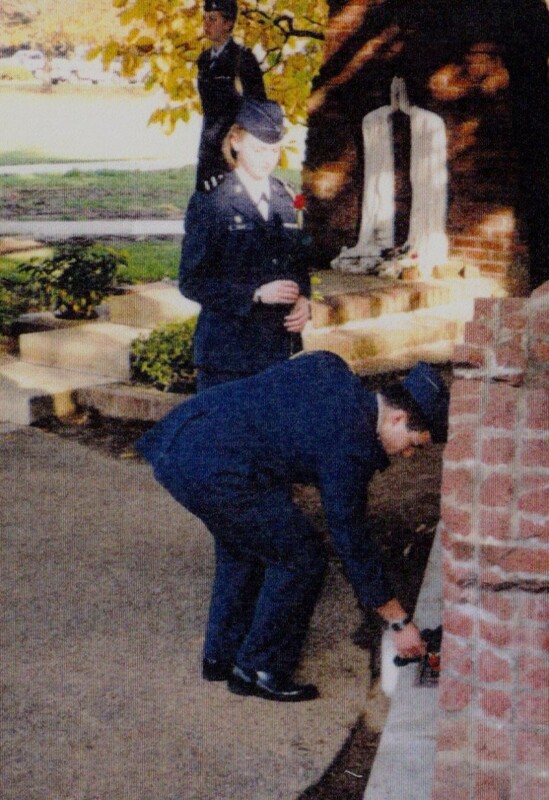 Since 1987 cadets of Air Force and Army ROTC have marked Veterans’ Day by mounting a twenty-four hour vigil at the memorial. 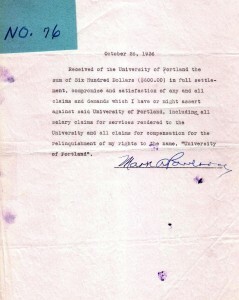 And this being Portland, keeping vigil rain or shine means lots of hours spent in the rain. 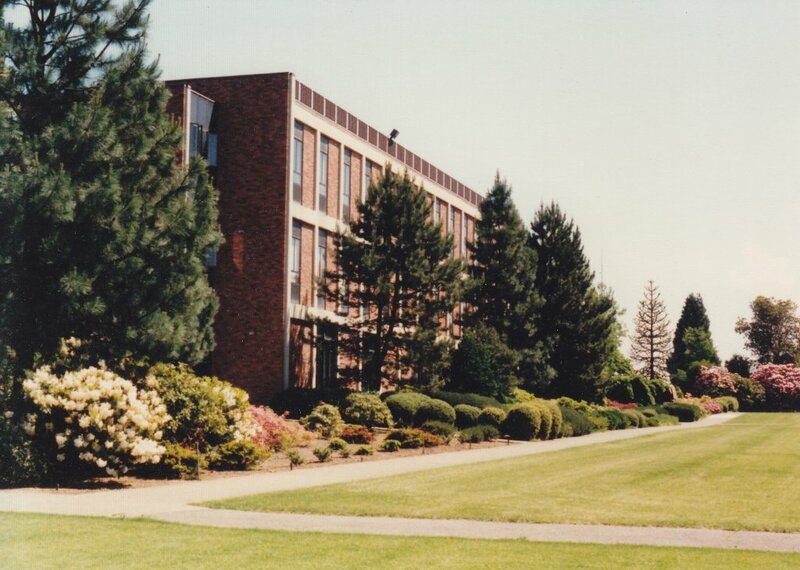 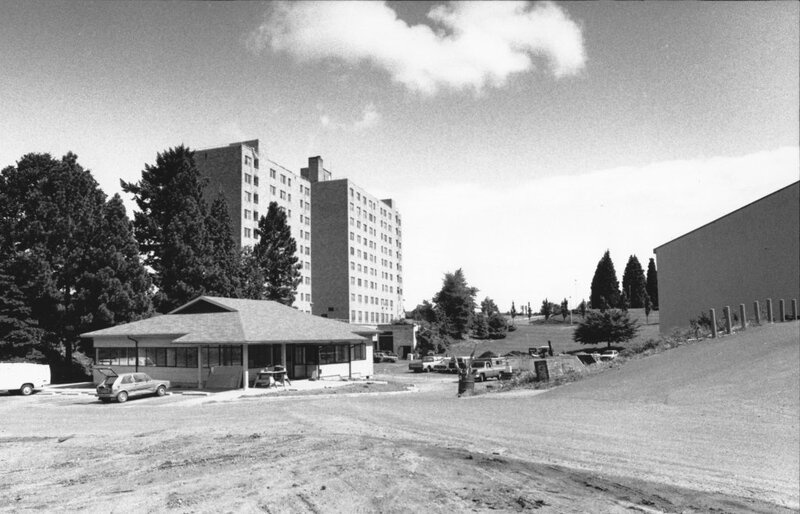 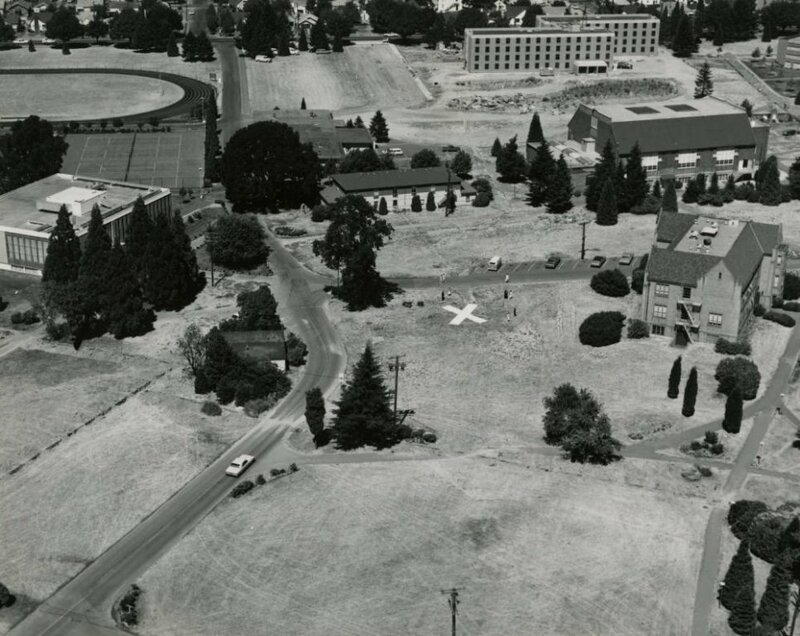 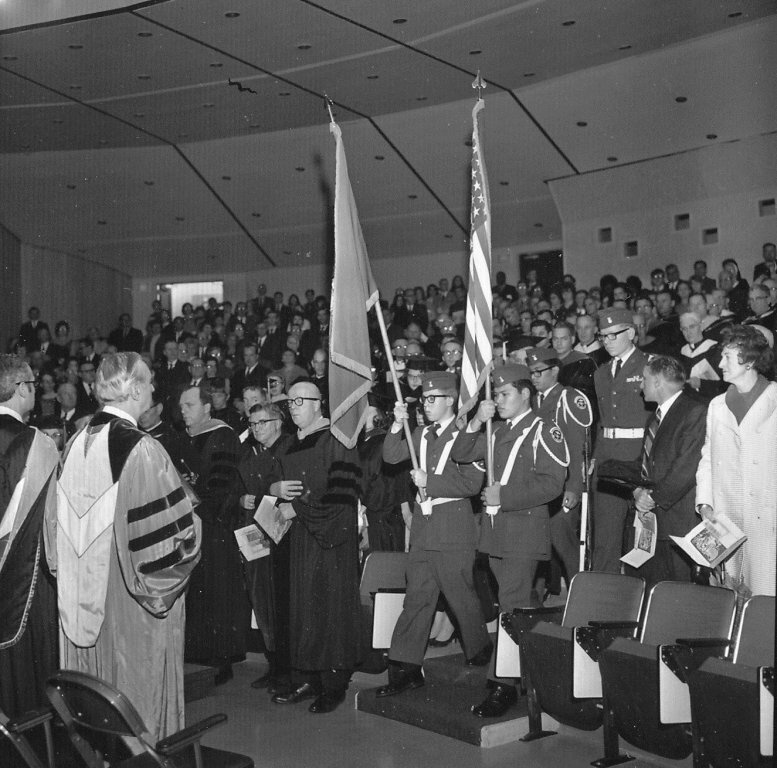 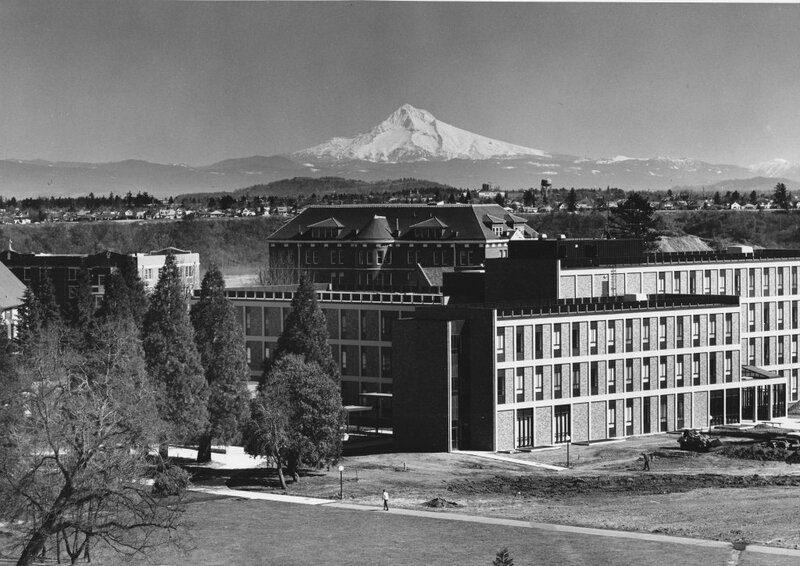 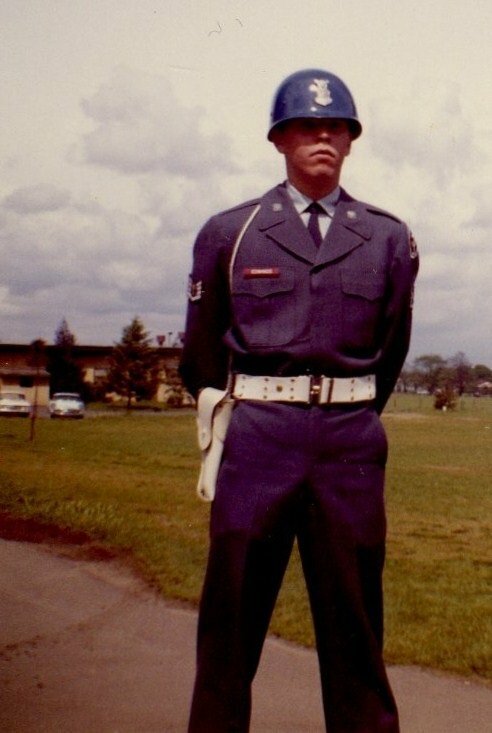 The Air Force cadet program (DETACHMENT 695) has been a part of the University of Portland since 1951. 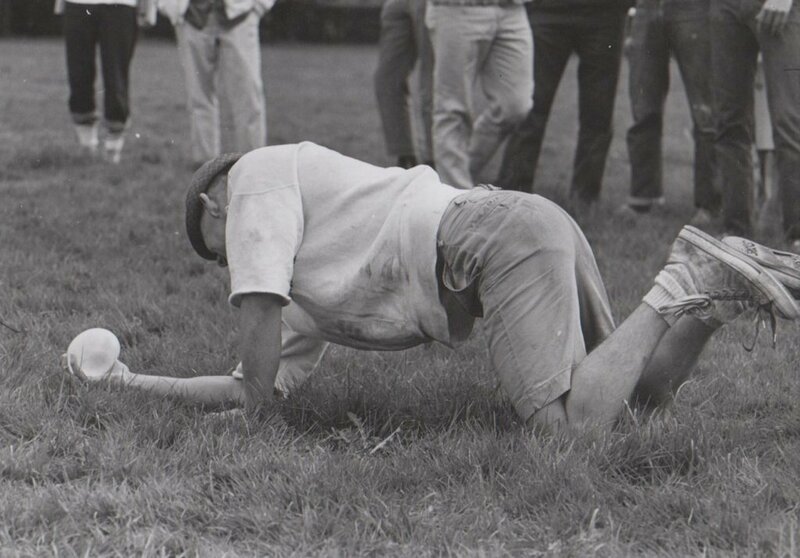 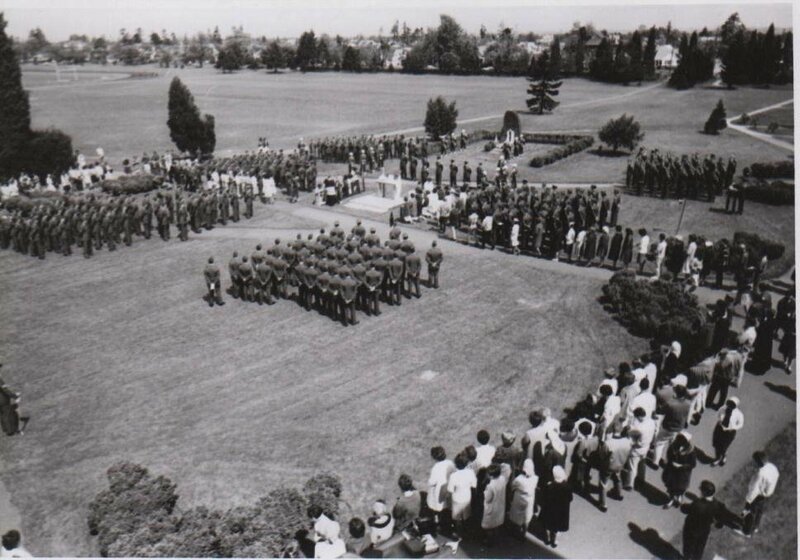 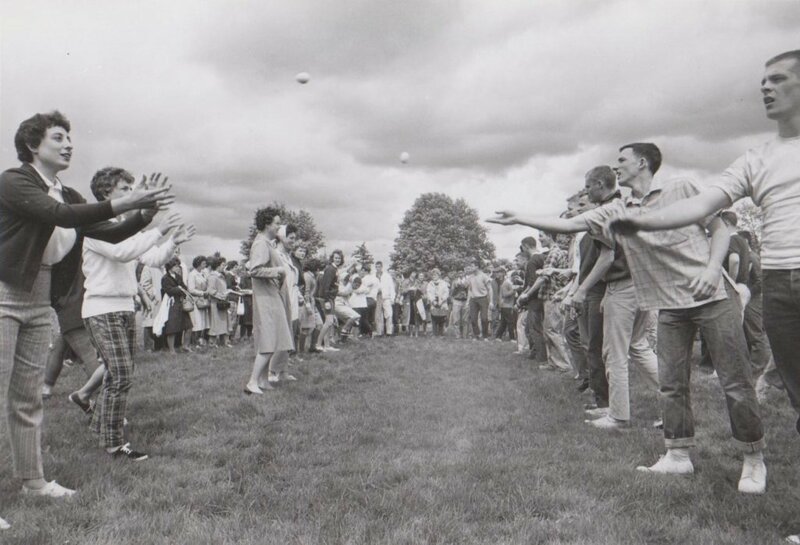 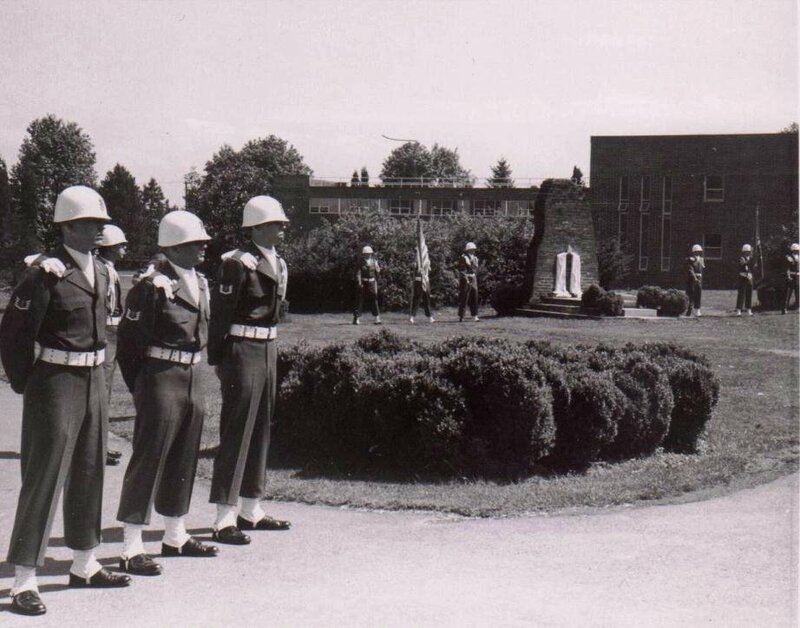 In these historical photos from the University Archives, we see the cadets prominently standing as Honor Guard at the Praying Hands during outdoor Military Mass, part of Campus Day, a spring-time tradition and celebration (picnic, dance, balloon toss!). 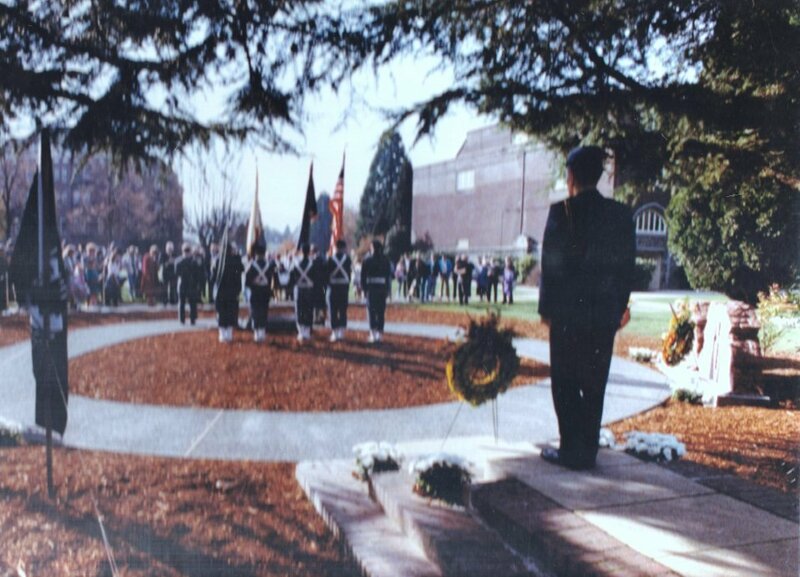 Each year the cadets honor the fallen with a thirty minute service beginning at 11:11 a.m. 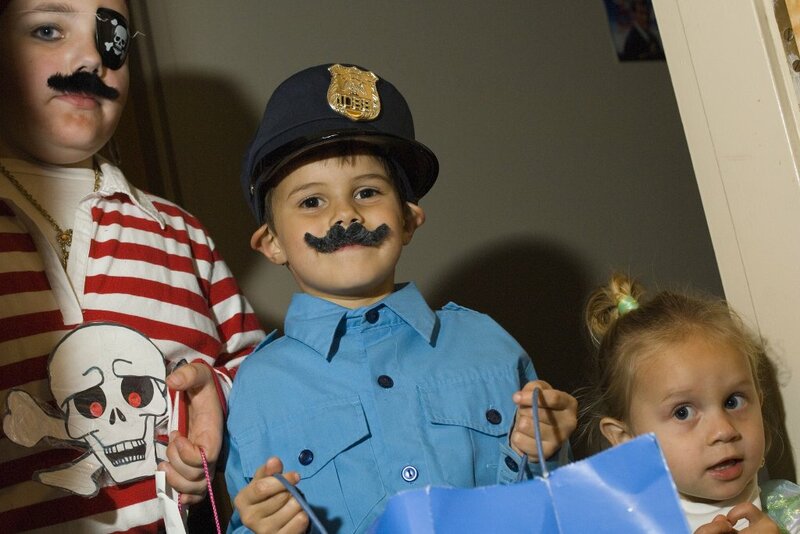 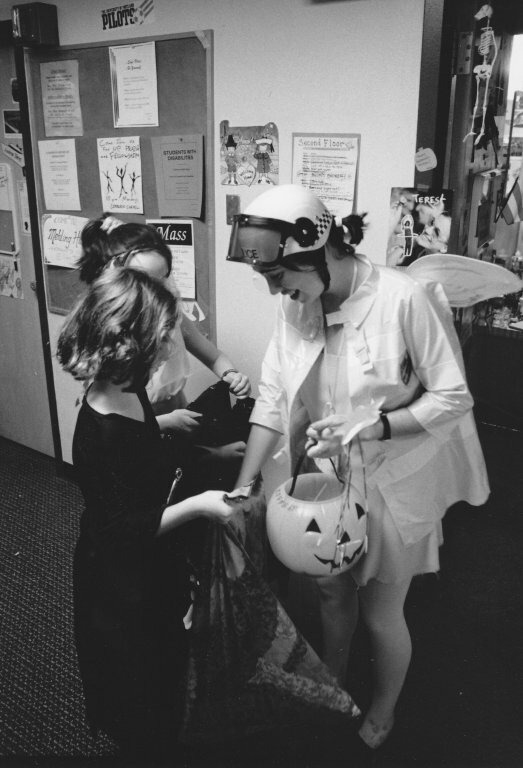 This October students host neighborhood children in the residence halls and the Chiles Center for Halloween fun. 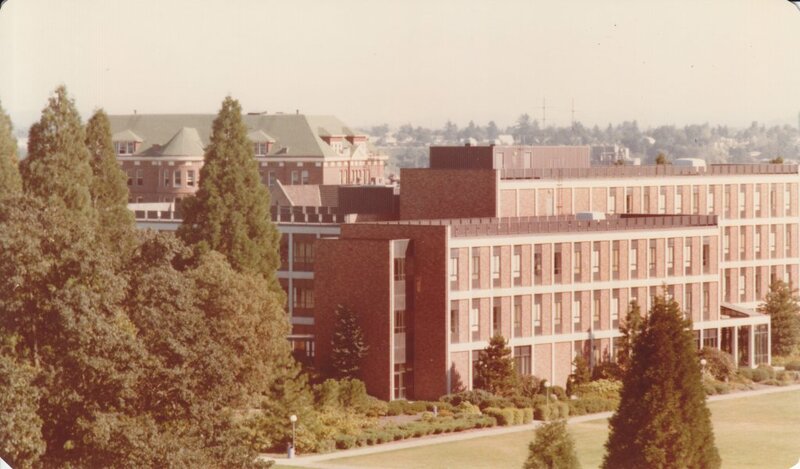 The basement of Shipstad Hall, scary enough in normal times, is decorated as a Haunted House. 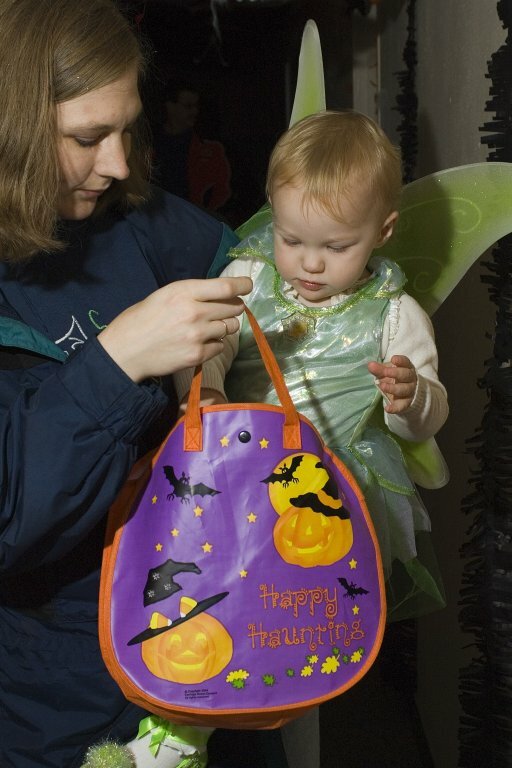 And Trick-or-Treat events are scheduled for monsters, princesses, and characters from Frozen (college students as well as visitors in costume) on Halloween Day. 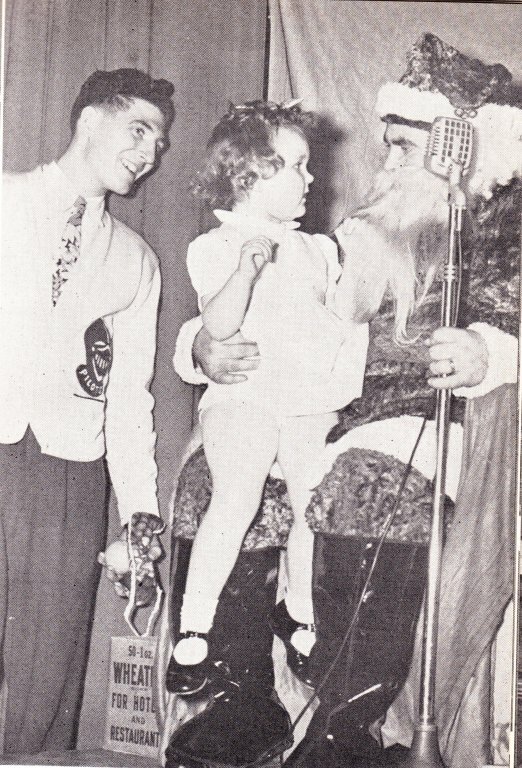 The seed of these celebrations, from an earlier slice of time, is the annual Orphans’ Christmas Party. 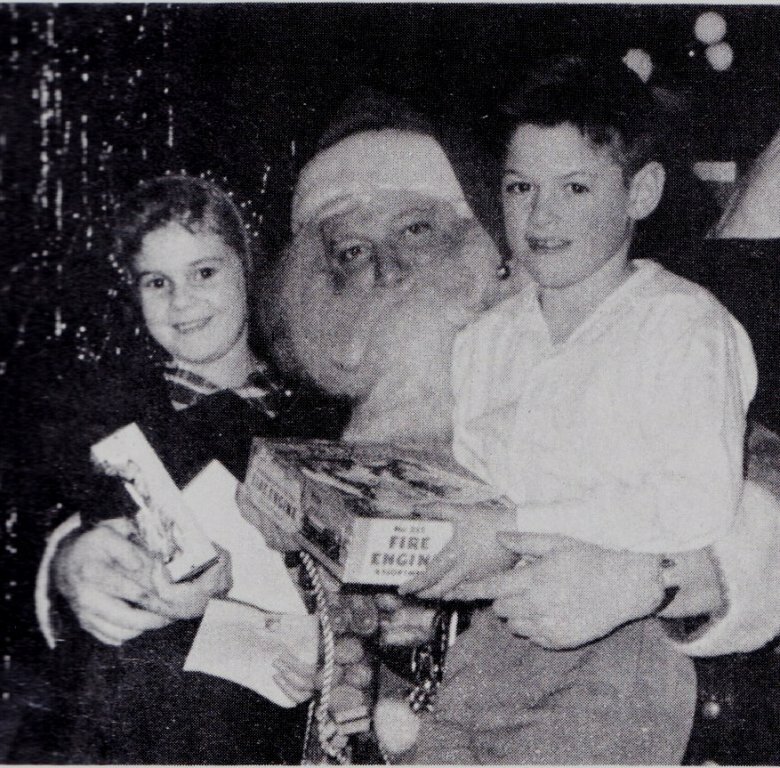 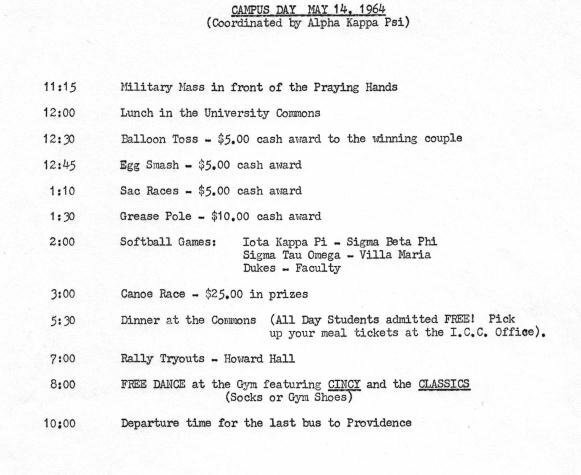 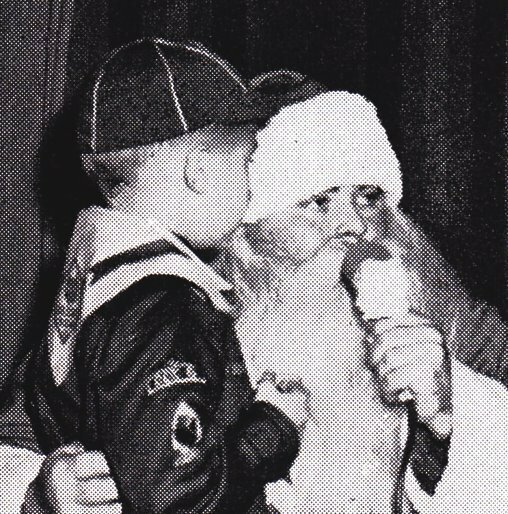 From as early as 1948, University of Portland student run service groups sponsored and hosted Christmas parties for children from St. Mary’s Home for Boys (Beaverton) and Christie Home for Girls (Oswego). 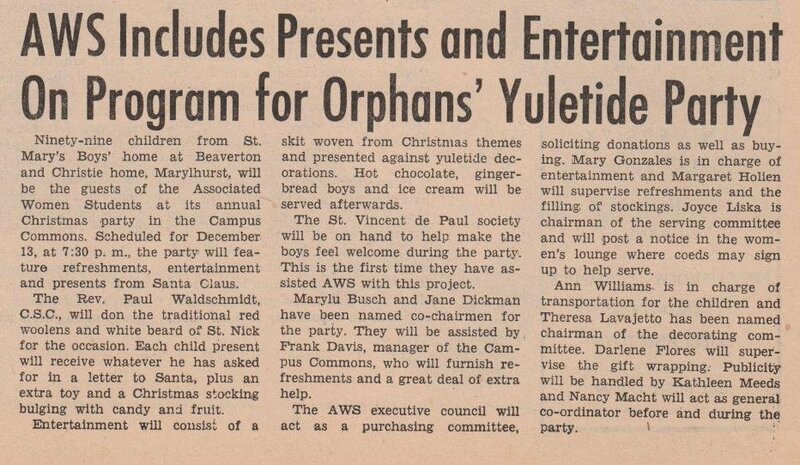 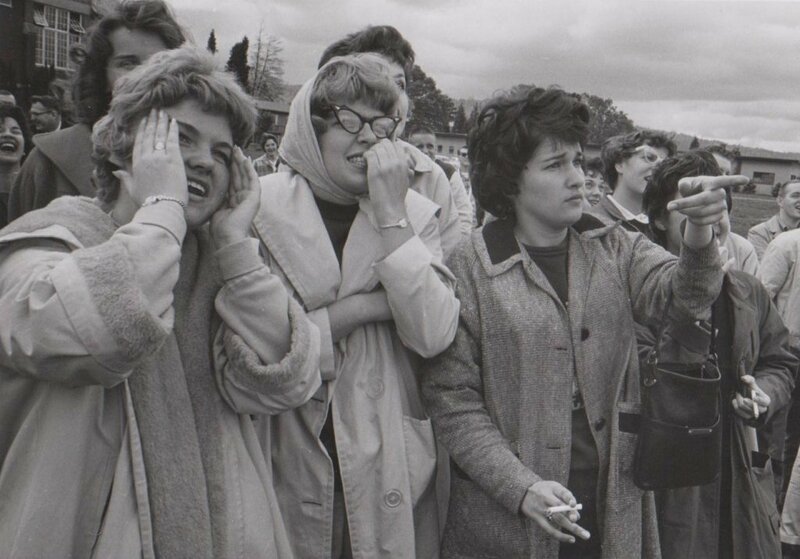 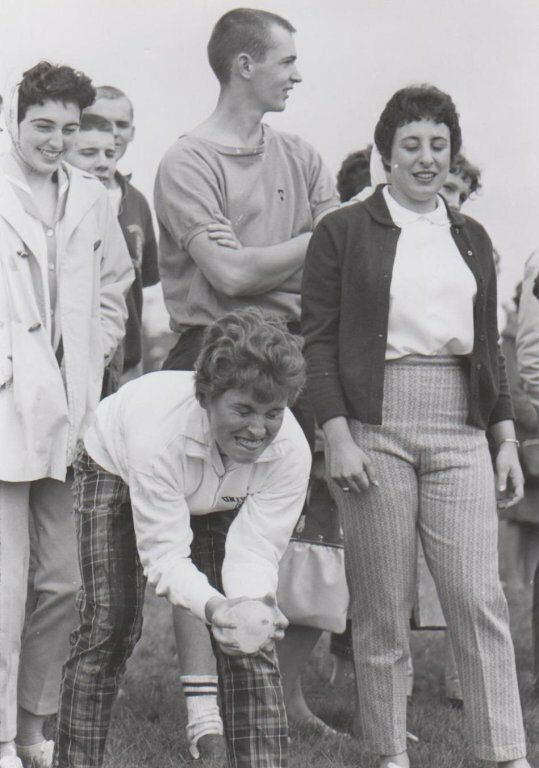 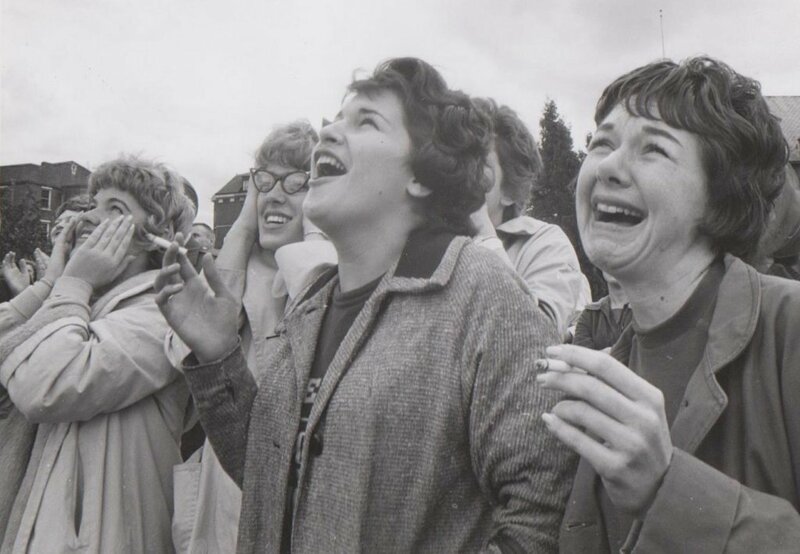 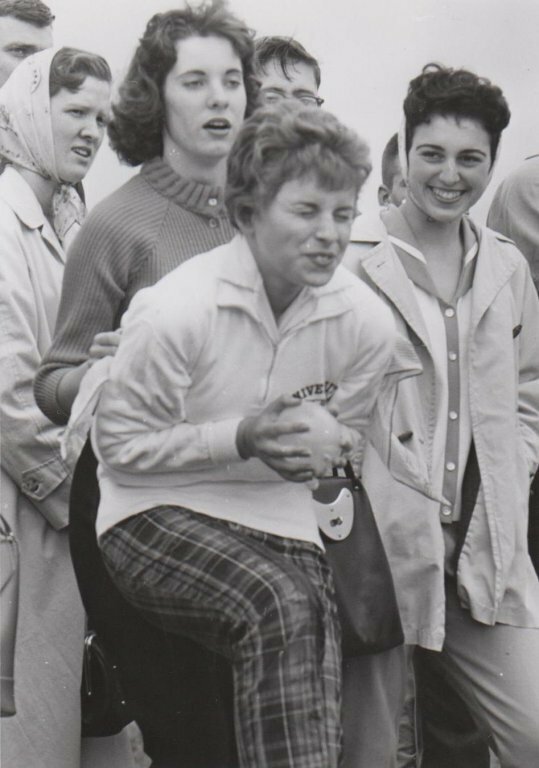 The tradition was maintained into the 1960s by the Associated Women Students, bringing as many as 100 orphan children to campus each year for this holiday event. 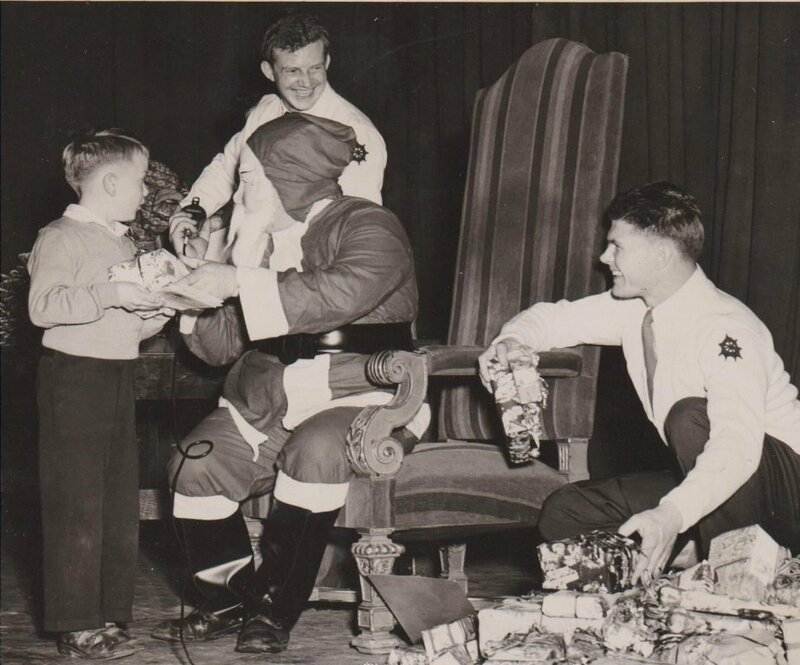 Then, as now, the festivities were almost as much for those who give as for those who receive. 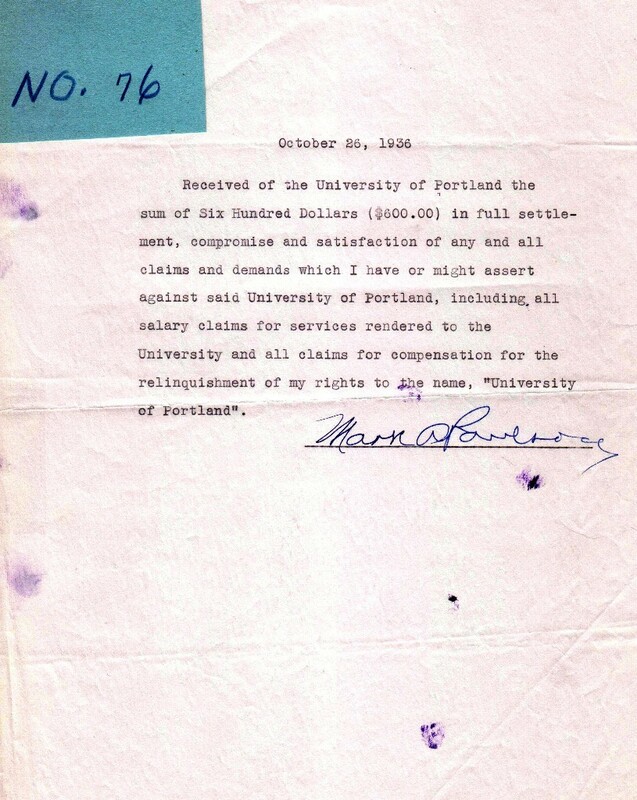 On October 26, 1936 the University paid a sum of $600 to Mr. Mark Paulson for relinquishing his rights and claims to the name, “University of Portland”.